GarageBand on an iPhone? Yes indeed. GarageBand for iPad has been a massive hit, and deservedly so, but iPhone and iPod touch owners have had to be content with casting envious glances at it. That's all changed now, however, because Apple has just announced that GarageBand is now a universal app that runs on all of its iOS devices. This means that if you already own GarageBand for iPad, you can have it on your iPhone or iPod touch for free. New users will have to pay £2.99. GarageBand for iOS is available to buy on the App Store now - Apple's press release is below. 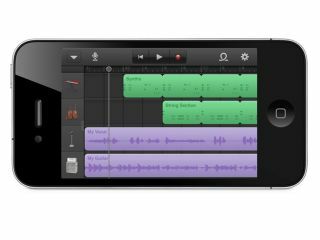 Apple today announced that GarageBand, its breakthrough music creation app, is now available for iPhone and iPod touch users. Introduced earlier this year on iPad, GarageBand uses Apple's revolutionary Multi-Touch interface to make it easy for anyone to create and record their own songs, even if they've never played an instrument before. "GarageBand on iPad has been a big hit and we think customers will love using it on their iPhone or iPod touch," said Philip Schiller, Apple's senior vice president of Worldwide Product Marketing. "The innovative Multi-Touch interface combined with Smart Instruments makes it easy to create great sounding music, even if you've never studied music or played an instrument before." GarageBand features a collection of fun Touch Instruments that sound great and make it easy for beginners or experienced musicians to play and record keyboards, guitars, drums and basses in a wide variety of styles. Smart Instruments now allow you to choose from an extensive new library of custom chords so you can play and strum along with your favourite songs. You can plug your electric guitar into iPad, iPhone or iPod touch to play and record through classic amps and stompbox effects, or record your voice or any acoustic sound using the built-in microphone. GarageBand allows you to record and mix up to eight tracks and then share your finished song with friends or send it to your Mac to keep working on it in GarageBand or Logic Pro. GarageBand 1.1 for iPad, iPhone and iPod touch is available on the App Store for £2.99 to new users, or as a free update for existing GarageBand for iPad customers. GarageBand is a universal app that runs on iPad, iPad 2, iPhone 3GS, iPhone 4, iPhone 4S and iPod touch (3rd & 4th generation).